The history of the Rolex Cosmograph Daytona begins with the production of the reference 6263 in 1963 (although ‘Daytona’ didn’t appear in official advertising until 1965), so in this the year of its 50th anniversary, there has been a lot of chatter amongst Rolex aficionados and addicts about what Baselworld 2013 would bring in terms of commemorative models. 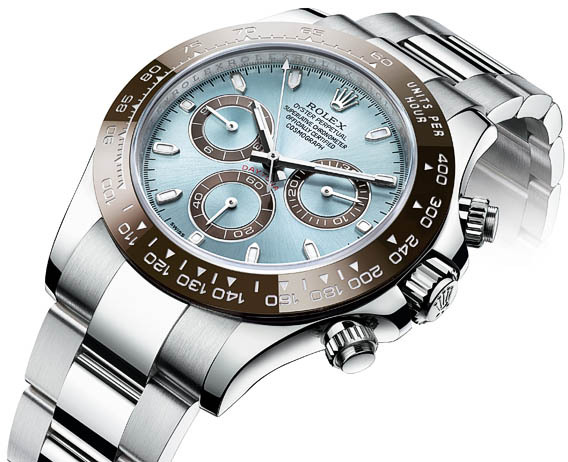 Well what they have done is their first platinum Daytona (Ref 116506) with a Cerachrom (‘ceramic’ to the rest of us) brown bezel and ‘blue glacier’ (or ‘ice blue’) dial. The numerals and graduations are on the bezel have a thin layer of platinum that was applied via a PVD process. This by-default commemorative piece is 40mm (the first Daytona, Ref. 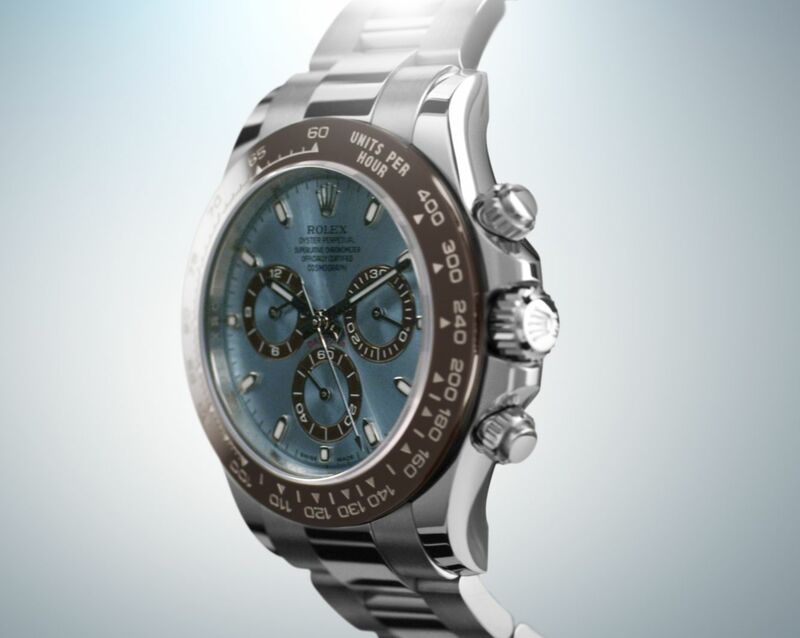 6239, was 37mm) as per modern Daytonas, with an oyster bracelet, and the automatic Cal.4130 inside. I admit that I’m not really a big Rolex person but as an anniversary model, I am not entirely sure that I understand it. If you are a Daytona fan what are your thoughts? Is this how to celebrate a 50th anniversary? Although the combination is not an unknown one fashion-wise, the rather unusual colours chosen (and the softness of their tones) are unexpected, and in conjunction with the use of platinum they make the new Daytona ‘dressy’ rather than ‘tool’ for me. Rolex seems to be quite colour focused this year, so perhaps this is part of it. If it’s colour you’re after, it comes in spades courtesy of the new (old) Oyster Perpetual Day-Date. In 18 ct yellow, white or Everose gold, this 36mm collection has matching dials and leather straps. I say ‘new (old)’ because these are based on the Day-Dates of the 1970s with colourful lacquered dials with matching straps that became known colloquially as ‘Stella dials’, allegedly because of the shiny quality of the dials (from the Latin ‘stella’ for ‘star’). The colours for the new models are green or cognac for the YG case, blue or cherry for the WG and chocolate or Rhodium in the Everose gold. The Day-Date is otherwise unchanged from the standard model, 36mm and containing the automatic Cal. 3155 movement. As the original ‘Stellas’ didn’t exactly reach extreme heights of popularity, it will be interesting to see what happens with these ones. I would hazard a guess, with men’s watches being what they are in 2013 both size and designwise, that at 36mm and in such a kaleidoscope of colours, these new Day-Dates may end up being worn more by women than men, though there are obviously men who find the colour options very attractive. A friend and Rolex aficionado tells me that the original Stellas were made for women.